First cut a 5 3/4" x 9" piece of Stampin' Up! Melon Mambo card stock and fold in half for the base, a piece of 4 1/4" x 5 1/2" piece of Stampin' Up! Bermuda Bay card stock for the first layer and a piece of 4 1/8" x 5 3/8" piece of white card stock for the front. Next using a Stamp a ma jig stamp the yellow netting using the double-stamping technique (ink the stamp, stamp on scrap paper then on your card w/out re-inking) in Stampin' Up! Daffodil Delight ink,the the pink dashed line in Stampin' Up! Melon Mambo ink, again with the double-stamping technique, then the postal stamp, ferns, and sentiment in Stampin' Up! Bermuda Bay ink. Then cut the base butterfly out of white card stock with a die from the Stampin' Up! 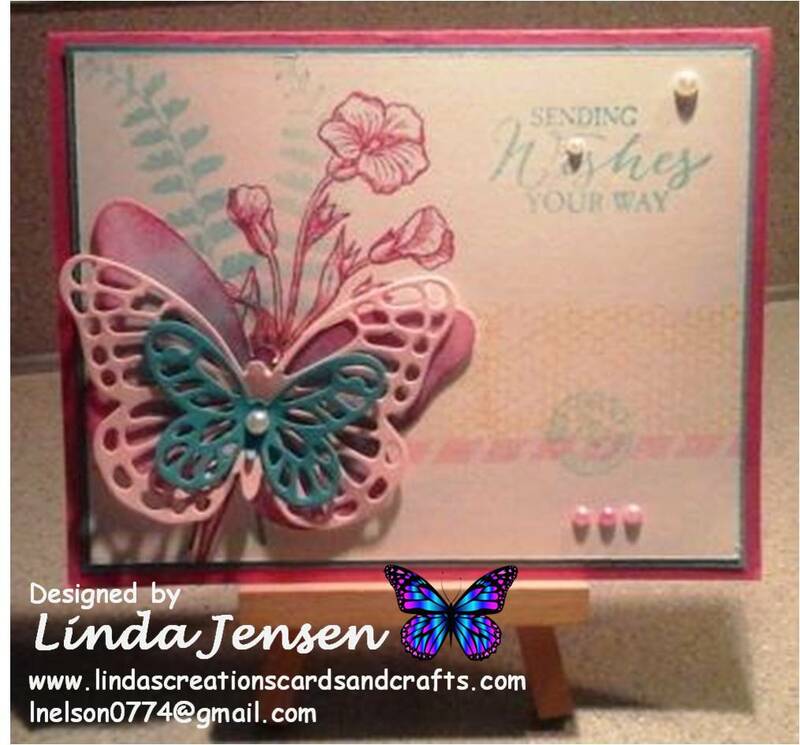 Butterfly Thinlits Dies set and sponge it with Bermuda Bay and Melon Mambo inks. Next cut the center butterfly out of Stampin' Up! Pink Pirouette and the small one out of Bermuda Bay card stocks. 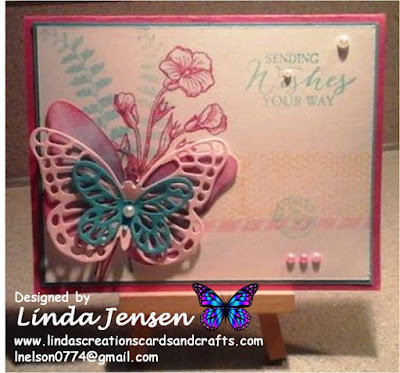 Then attach the butterflies to each other then to the card with mini pop dots and the self-adhesive pearls. Finally finish assembling the card and enjoy!